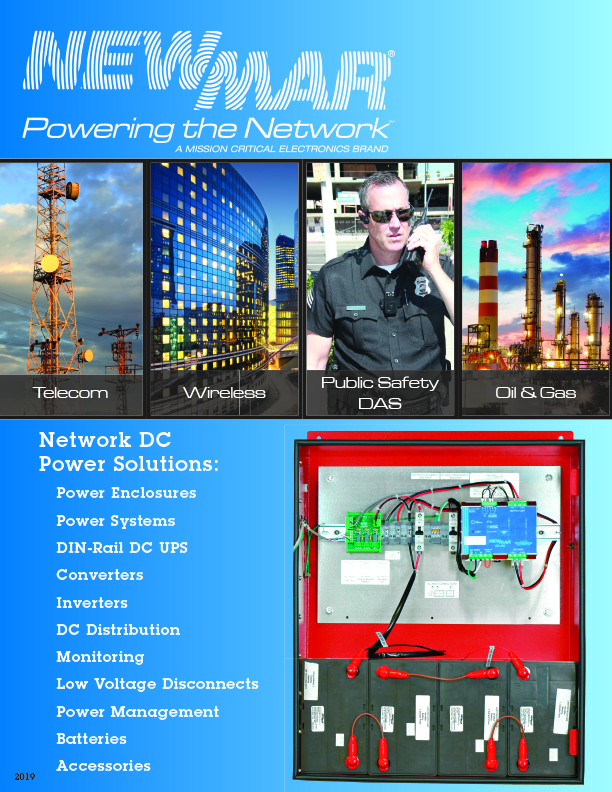 Powering the Network by Newmar with a new 3000 watt, 48VDC power inverter, model 48-3000RM. The new DC-AC inverter is ideal for critical communication equipment or remote sites that are sensitive to the loss of AC power. The new rackmount inverter provides seamless back-up when AC powered equipment needs to be protected from loss of utility power due to a storm, routine maintenance or another unforeseen event. The 48-3000RM by Newmar provides pure sine wave AC output that powers telecom equipment such as microwaves and radios without any performance degradation and is contiuously duty rated that allows full output wattage, even during extended AC power outages. The output, 3000 watts, easily is cascaded for N+1 redundancy, providing maximum reliability required for data centers. The high efficiency (89% – full linear load at 120 VAC output) unit features a <6mS fast load transfer switch for utility bypass. The 48-3000RM rackmount inverter features four NEMA 5-15R AC receptacles and provides numerous circuit and load protections including over- temp, overload, reverse polarity, high/low battery voltage, and AC input breaker. It also has Form C alarm contacts for monitoring of abnormal conditions and features a user friendly status and diagnostic LED display. It enables remote power management via an opational remote control relay RS-232 port and has physical Inverter mode/UPS mode switch. 48-3000RM fits in a standard 19″ relay rack and occupies 2RU (3.5″) vertical rack space. I will email you with more information.